Today post marks the start of a new Youtube series in nail designs that I have been wanting to do for quite now. Lately I have been loving Gingham fabric, and with that in mind I wanted to show off a very easy tutorial on how to get this really cool look on to your nails. Its super easy and cheap to do. All you need is some white and coloured nail polish, frosted scotch tape and a topcoat. It’s a really simple process with only five steps! Step 2. 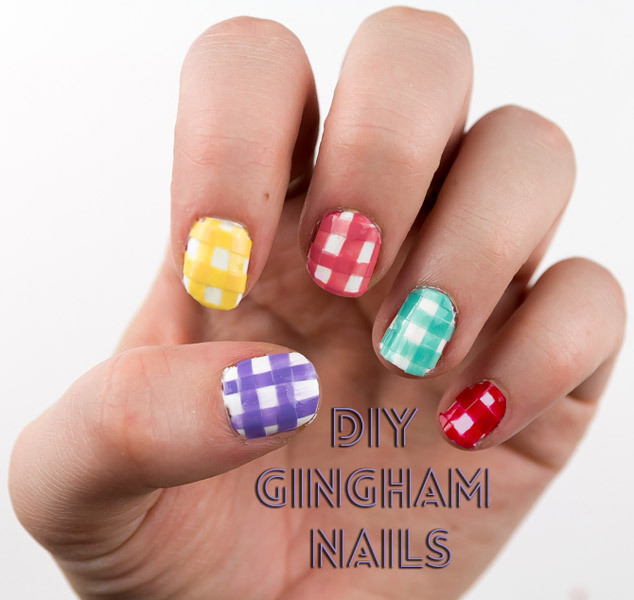 Paint some frosted scotch tape whatever colour you want your Gingham nail art to be. And wait for It to dry. Then cut in to thin strips. Step4. Trim the excess using nail clippers / scissors. Step 5. Apply a topcoat this will keep the scotch tape on your nails and seal the gingham nail designs. In my video I painted all my nails different pastel colours but you could mix these up for alternative nail designs or just painting one nail with this pattern and then the rest plain. Considering that there is nothing used in this tutorial other than what you can find in your house I am really happy with the final look. This look can be created on a budget without the need of any of the nail art tools that you might otherwise need and you don’t need a steady hand! Let me know if you try out my gingham nail art, leave some photos of them if you do in the comments and if you have any ideas for further nail designs please request them in the comments below! You can find my other nail art posts here.